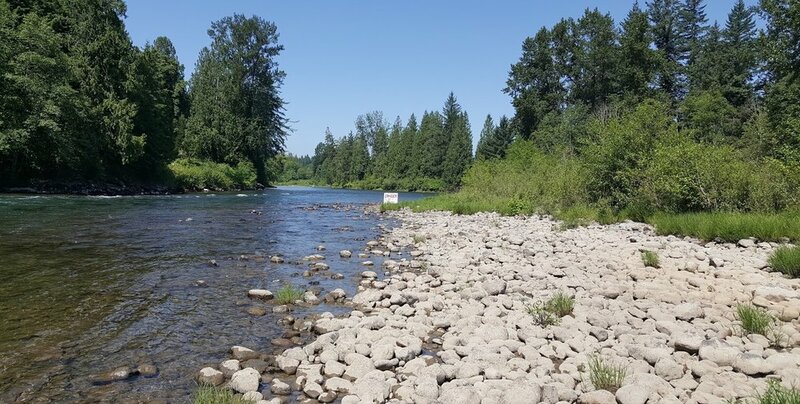 Over the winter, there have been some negative comments and misinformation shared by a few residents in the Snoqualmie Valley that seem set on disrupting the summer operations of Fall City Floating. We care about our reputation and disappointed to hear that Fall City floating is being blamed for many things that are entirely untrue. Under the "For Residents" section, we have made additional pages that tells the story of Fall City Floating that might enlighten you on the reasons for the creation of this business and the need for it to continue, that details our coming changes for 2018, that shows our annual statistics, and finally one that outlines the need for permits on our overflow lot. We will be at the Fall City Community Association on May 1st, 2018 to present our plans for this summer and address anymore concerns that you may have. Thanks for supporting local business and local discourse. Fall City Floating Increases Traffic on the River! We haven’t advertised since 2015. We spend money on our web-hosting fees, our booking system and the emails that we send to our clients with our company and river policies. During that first year, we did a groupon. We have never done TV work or newspaper articles. Our facebook page and website provide necessary information to river tubers that ensures they will have a safe time on the river and give real-time updates if necessary (like if we are sold out and need to stop more people from showing up). They would have needed to have already heard of our business in order to find these pages as we don’t pay for adwords or other methods of website traffic generation. We are not denying that there are more people on the river now than say 2010. But any additional traffic to the river is due to a boom in the Seattle Area population, growth in the Snoqualmie Valley (500% in 15 years), and sharing between people who had a great experience at the river. Fall City Floating cannot control the number of people who live in the area and want to use natural resources for recreation (see Mt Si Trail-head & Rattlesnake Ridge as other examples). All we can do is make it safer and lessen the impact. Why is one business profiting off the river while we (the residents) are taking the cost! If you look at our profit margins, from 2015-2017 combined, we have taken a total of $3,908 in profit. Since it is an LLC with a sole owner, that is the entirety of the earnings for the ownership. Please compare that to the over $150,000 that we have paid in taxes, concession fees, permits, and licenses to the government. We have additionally paid out over $115,000 in wages to college and high school employees over the 3 years who are also paying taxes. All of the while, we have been running the entire trash program, managing the safety of the river, and educating folks as best as we on how to properly treat this resource. Businesses are far more expensive to run than it looks, especially when you have to setup and dismantle it each year and put so much into protecting the environment. Seems more like we have socialized the benefits and privatized the costs. As our revenues continue to grow, we add more employees to handle the workload of the garbage pick up and customer volume and new programs to help promote conservation of the river. We are happy to show anyone our tax returns to validate these numbers in person. Fall City Floating doesn’t pick up after themselves! In 2017 alone, we spent 660 of 5230 labor hours cleaning the river and all the river entry and exit sites. Our employees were dedicated to the task and took it to heart (since many of them are Snoqualmie Valley Residents). We would fill our 4 yard trash dumpster and recycle dumpster by Friday each week (it's picked up on Mondays) and we would take a couple additional loads of trash to the Factoria transfer station on Sunday and Monday Mornings in one of our tube trailers. Here is a map of our trash management schedule. This is done like clockwork throughout the summer months. We may not get every single bottle cap or tiny scrap of paper all the time, but we do our absolute best when scouring these areas to ensure that the area is clean and returned to it’s original beauty. If you see an area that we manage that needs more attention, feel free to give us a call directly and let Simon know, or maybe wait 24 hours (particularly if it is the early morning before we have opened for the day), it is likely that we will get to it within that days shift. Their employees are disrespectful to residents! All Fall City Floating employees report to Simon Briant. Their job is to take care of our customers and Simon’s directives. They are not at the mercy of the locals to do your bidding. If locals have an issue with a specific thing, they need to communicate with Simon. Going directly to the employee is going to a result in them being courteous and respectful the majority of the time. But ultimately they are teenagers who are just there to do their summer job as directed. How would you react if someone came to your place of employment, told you that you were under performing and how to do your job. After that interaction with a complete stranger, the employee is going to continue the job Simon has asked them to do, most likely help customers, tend to our parking lots, and pick up garbage as scheduled. Additionally, over 60% of our employees in 2017 were local to Fall City and the Snoqualmie Valley. A common joke on their first day of work is to meet all the people that they already know from their time at Mt Si High School. A statement that says our employees are disrespectful to residents of the valley is disingenuous because they are the residents of the valley. Fall City Floating has no cut off time for putting their customers on the river! These reports have no basis in reality. In fact, we are incentivized by our business model to ensure our renters, and therefore their equipment, get back before the sun goes down so that we can close for the day and send our employees home. Each week, we track the total float time, add an hour, and subtract that from the time of sunset for that day rounded down to the nearest hour. This is the time that we end our rentals for the day. As an example, when the float time is 4 hours in early August, we add an hour to make 5 total hours. Let’s say it is the week of August 6th, 2018. Sunset is around 8:30pm that week. We would therefore end rentals at 3pm. This time gets earlier throughout the summer and ultimately gets as early as 2pm. Any shuttle rides upto the launches after our rental cut off are returning folks upto their cars if they parked at the top, garbage sweeps, or picking up tubers who found themselves on Hwy 202. Any floaters on the river after dark are not affiliated with Fall City Floating. The Salmon are hurting from River Usage! Chinook are the first to return after summer, with the first fish showing up in late August. Char & Chum begin in late August, peaking in September and October and ending in November. Coho generally arrive late in September and continue through late November. Sockeye Salmon are not native to the Snoqualmie River. Pink Salmon spawn close to salt water. Given that our season runs from June - August, it is severely misguided to say that we even have a remote effect on in-river Salmon populations or their ability to spawn. Fall City Floatings Reviews say the River is Dangerous! We have a total of 132 reviews across 4 different social platforms (Google, Facebook, Yelp and TripAdvisor). The majority are 4 or 5 stars from folks who have actually used our business. We have 5 reviews across all the platforms that have stated that the river is dangerous, 3 of which are from the same person across different platforms. Apart from 1 or 2 other actual reviews, our 1 star reviews are from residents of the valley attempting to downgrade our total ratings. All these negative reviews do is increase the number of people who share their great experience with us to combat these spiteful reviews. Our average rating across all media platforms is 4.1 / 5 stars. At the end of the day, even though we constantly strive to improve safety, our customers are made very aware that they are floating by themselves in a natural environment. Anyone under the age of 18 renting our equipment has to be accompanied by an adult and as such, we treat our customers as adults. As with any outdoor activity like hiking, skiing, or climbing, anyone not up to the task needs to take it upon themselves to not float if they do not feel comfortable. We are a rental equipment and shuttle company, not a tour guide or baby-sitting service. Fall City Floating provides Styrofoam Coolers! This is a pretty easy one. Fall City Floating has never and will never sell or provide styrofoam coolers to customers. We have a cooler rental that is a hard 48qt Coleman cooler that families typically fill with a lunch and water for the day. The Water Quality of the River is worse at the end of the Summer! There is zero difference between the water in the river at the beginning of summer and the end summer besides temperature and flow rates. In fact, water quality is significantly better at the end of summer due to the lack of silt being turned up by the river against the banks as the flow rate decreases. We take photos of the river before the summer and after to ensure that the area looks as pristine as we started with and ensure that our customers will always have a clean river to float in. We have done a sweep of our 4 mile stretch of river on 3 different days at the end of each summer to ensure that there is no trash on the banks or visibly in the river. Taken mid-summer to show King County the location of one of our signs. Farmland Needs to be Preserved! Please check out our overflow lot page for the reason for this comment. Right, which is exactly why we as a company are farming the parcel that we purchased in addition to parking on the site for 60 days a year as a favor to our neighbors. This parcel that we are using as our overflow lot has been a bare lot of grass for about 10 years prior. Residents can feel free to visit our pumpkin patch in the Fall. We can’t wait to see how it turns out.